So you bought a truck, put cap/canopy on it and now you can't reach all the stuff you put in it. Every time you stop, it all goes to the front of the bed. It's time to Extend Your Reach with the BedSlide sliding truck bed organizer. With the simple twist of the handle, you can pull all your stuff out to you. No more crawling on your hands and knees. Bedslides have been popular with fire departments to help them get to their stuff fast and easy. Not only is the Bed Slide the most affordable slide on the market, but its quality construction and simple design makes the Bed Slide the most necessary accessory you'll ever own. The Bed Slide comes fully assembled and installs without bolting, making complete removal less than a one-minute job. Fully extended, the Bed Slide will hold up to 1200 pounds. Carry more weight than that? 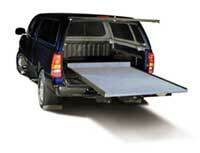 No problem, simply bolt the Bed Slide to your vehicle for an increased weight capacity. Make your life easier, get a BedSlide! Available in Weather Deck and the classic Carpet model. Both models come fully assembled, so there is no need buy special decking material. Portability is a feature that the current models boast, two people can remove a bedslide in less than 1 minute! And the products come with a Limited Five Year Warranty. New to join the weather deck and carpet deck is the contractor grade. This all-new design answers our customers demand for a worker's grade Bed Slide. Available in the domestic shortbox (IFW3000), longbox (IFW3500), and SuperDuty shortbox (IFW3250), the Contractor Grade touts the following extra features: 4 more bearings, reinforced steel framing, powder coated finish, TufDec decking, rubber mat, and 4" aluminum side rails and headboard. Designed with the builder in mind, the Contractor Grade is great for anyone who needs a little extra abuse-resistance. (some minor assembly is required). Need a little more room for that ATV or motorcycle? There is nothing more perfect for this type of hauling than a truck bed extender. Now you can instantly add up to two extra feet to the back of your truck. The Westin bed extender is constructed of durable, light weight aircraft aluminum and is easy to use. Simple lower the tailgate and flip it into position on your tailgate and you're ready. Flip it in and close the tailgate and you have a secure cargo area to keep all the small stuff from rolling around. 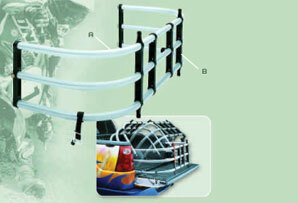 Truck bed extenders are easily UPSable and they install fairly easy. They usually use the existing bolt holes already in the truck but on some models you will have to drill. You wont need to be a rocket scientist to do this. Do you sometimes find you have something to haul that won't quite fit in the bed and need more room? Is it your time for a sliding truck bed organizer?